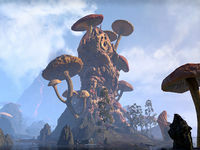 Tel Fyr is a Telvanni tower found in the Azura's Coast region of Vvardenfell. It is the home of renowned wizard Divayth Fyr. The tower serves as the entrance to the Halls of Fabrication trial. This page was last modified on 18 February 2019, at 17:08.